Incorporating a robust burst resistant design which can withstand up to 300kg of load, the Fitness Mad Anti-Burst Swiss Ball comes in a size of 45cm (17.7’’) in diameter, and can be used as a seat for people with back & postural problems. It’s a great aid during rehabilitation and physiotherapy, and additionally it’s suitable for numerous workouts, and stretch warmup drills. This great-looking swiss ball are also appropriate for pilates and yoga practice due to soft-in-touch material which grants good grip. for submitting product information about Fitness Mad 300kg Anti-Burst Swiss Ball - 45cm We aim to answer all questions within 2-3 days. for submitting product information about Fitness Mad 300kg Anti-Burst Swiss Ball - 45cm. We aim to answer all questions within 2-3 days. If you provided your name and email address, we will email you as soon as the answer is published. 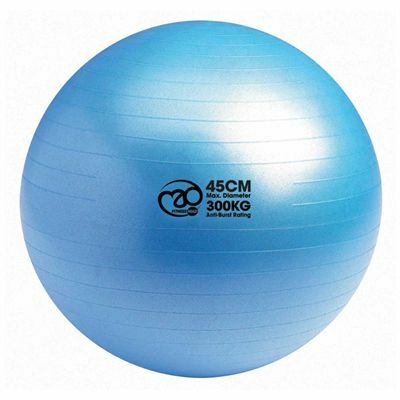 for submitting product review about Fitness Mad 300kg Anti-Burst Swiss Ball - 45cm.